A springtime favorite, asparagus is delicious, healthful and easy to prepare. Just steam, boil or microwave until tender to enjoy sensational spears. Asparagus is a member of the lily family and is related to onions, leeks and garlic. One serving of asparagus contains just 20 calories and is a good source of foliate and vitamin K. Just 5 stalks of asparagus provide healthy amounts of folic acid, vitamin C and disease-fighting antioxidants. Select spears that are straight, firm and similar in size to ensure that they cook evenly. Refrigerate asparagus as soon as possible. Before refrigerating, wrap the lower ends of the stalks in a damp paper towel and place them in a plastic bag, or stand them upright in a bowl of water. Helps the heart and reduces the risk of heart diseases. Your heart will love Asparagus. Loaded with nutrients: Vitamin C, A, E, K, B complex, hromium, and fibers. Copper and iron: increases production of red blood cells. Fights depression and puts you in a good mood. Great for kidneys. It helps cleanse the body and prevents kidney stones. Prevents bladder and urinary tract infections. Energizing and fights chronic fatigue syndrome. Considered a highly alkaline food. Feeds the friendly bacteria that live in the large intestine and keeps the digestive system healthy. Considered to be a powerful aphrodisiac. Asparagus is considered a diuretic due to it’s mineral profile combined with the amino acid asparagine. It has 289 milligrams of potassium per cup, 70% of your daily needs. Potassium helps control heart rate and blood pressure. High in glutathione. Glutathione (GSH) is an amino-acid that works as an antioxidant protecting cells from toxins. 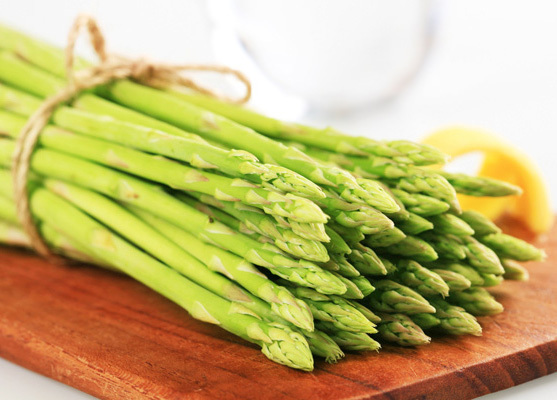 20% of your daily intake of vitamin A can be found in a single serving of Asparagus. Rich in vitamin K: promotes bone health limits neuronal damage in the brain thus preventing Alzheimer’s disease. Rich in B-complex vitamins.